We lived in Spain for a year when I was 10. My father got his gemology degree at the Instituto Gemologico Español. We fell in love with spanish food, (yes, I remember). My mother bought a gigantic Spanish recipe book and started trying recipes. My favorite was the gazpacho. 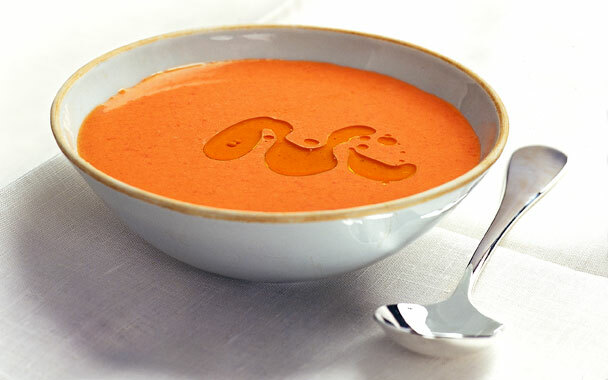 Gazpacho is a chilled soup with Spanish origins. It is widely consumed through Spain and Portugal. It is the perfect summer dish for its freshness. It is like a salad made into a soup. 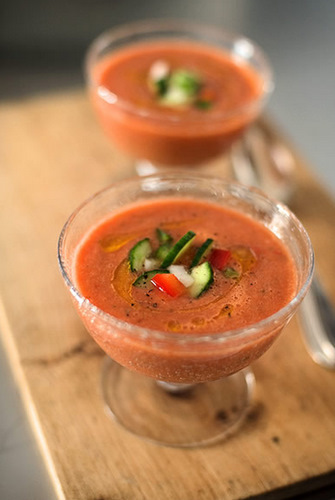 There are many reasons to love gazpacho: It's easy to make, you can make it ahead, you don't need a stove, and the presentation can be beautiful. I know it's the end of summer and I should have posted this way sooner but I hear it's still pretty hot everywhere and I just made this gazpacho this weekend for a dinner party and it was a success. 1 slice of a nice crusty bread (sourdough works) in pieces. Start blending the tomatoes, in batches. when its a puree, add the olive oil, vinegar and garlic and salt. Blend some more. Add the bread pieces and taste for salt and vinegar. it should have a good balance of salt and tartness. You can add half cup of water or so to make it a little smoother. Strain into a pitcher, check if it needs more water and chill for a couple hours. There are many ways to present gazpacho. The traditional way is to serve in in a soup bowl with the garnishes on separate little bowls so people can add as much or as little of each ingredient as they want. Or you can bring the little bowls already assembled. For parties, you can serve them in shot glasses sprinkled with smaller garnish and a parsley leaf and a little olive oil drizzle. You can also get creative and add crab meat or a grilled shrimp skewer, and make it a main dish.